Spanish Couscous, Thyme for Cooking simple, healthy, sides. 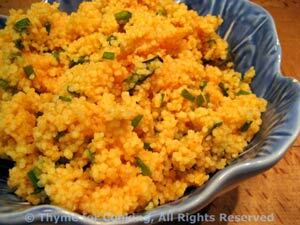 Couscous is so flexible, almost any liquid can be used to flavor it. The peppers are not cooked, just warmed with the couscous to soften a bit. Heat tomato juice to boiling in medium saucepan. When juice is hot remove from heat and add peppers, olives and couscous. Stir once or twice, cover and let stand for 10 minutes. Do not stir again. When time is up add herbs and olive oil to couscous, fluff gently with a fork to combine and serve.